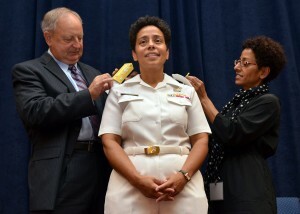 Vice Adm. Michelle Howard is now the first female four-star admiral in the Navy’s 236-year history. The promotion ceremony took place Tuesday morning at Arlington National Cemetery. Howard will assume duties as vice chief of naval operations, the service’s No. 2 officer. Howard graduated from the U.S. Naval Academy in 1982. In 1999, she became the first African-American female to command a ship—USS Rushmore (LSD 47)—for the Navy.